Every year, thousands of public elementary school children bring flyers and permission slips home to their parents, seeking to take part in an after-school “Good News Club” inside one of over 4000 public elementary schools in America. The flyers promise an hour or more of fun and Bible-centered character and moral education. Because the club takes place on public school grounds, parents assume their children will be safe and unharmed. But the snacks, games, prizes, songs, and fun activities mask a dark message of shame and fear indoctrination. The Good News Club curriculum is filled with over 5000 references to sin and thousands more to obedience, punishment, and Hell. It stresses Old Testament narratives of a retributive God who must punish sin, warns children that they will suffer an eternity in Hell if they refuse to believe, and stresses complete obedience as the supreme value. 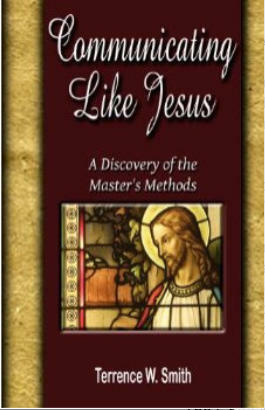 Meanwhile, salutary themes such as the “Golden Rule” are almost entirely absent from the curriculum. The Club prominently advertises its meetings to public school children in colorful take- home flyers, on posters hung in school hallways and on school bulletin boards, and on signs placed on the school frontage sidewalk during club meetings. 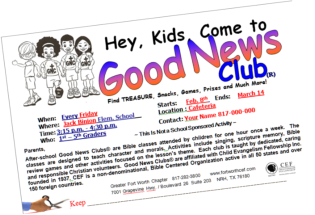 Students are encouraged to wear “Good News Club” T-shirts during class and rewarded with candies and other prizes for bringing classmates to the Club. The Club delivers its dark gospel message, immediately after the closing bell, to young 4-12 year-old children in public school classrooms, cafeterias, gymnasiums, and libraries. The Good News Club’s dark gospel, reinforced often enough, robs children of the innocence and enjoyment of childhood, replacing them with a negative self image, preoccupation with sin, fear of Hell, and aversion to critical thinking. Click on the thumbnails to the right to read various modern authors’ remarkably consistent recollections about what they learned at Good News Clubs growing up. © 2019 www.goodnewsclubs.info. All rights reserved.